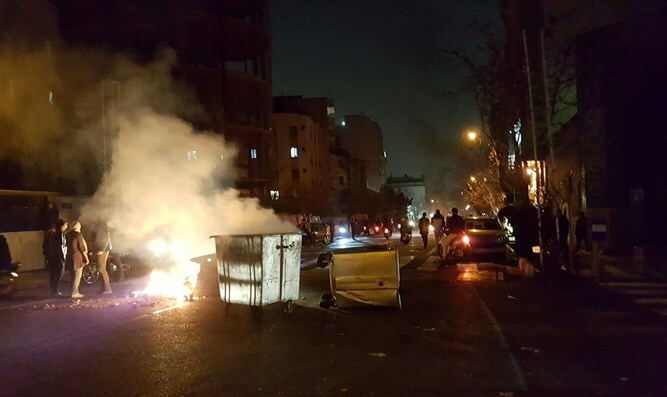 9 more killed as popular uprising against Iranian government continues, with rioters attacking army bases and police stations. At least nine people were killed in Iran overnight as a popular uprising against the Islamic regime in Tehran appeared to gain steam, with attacks on Iranian security forces and government facilities across the country. Since last Thursday, thousands of Iranian civilians have taken to the streets to protest against President Hassan Rouhani’s government and the country’s supreme leader, Ayatollah Ali Khamenei. The uprising, the largest since a series of mass protests in 2009, began in the city of Mashhad, when demonstrators denounced President Rouhani over the failure to reduce the country’s high unemployment rates. Videos on Nazar's Telegram channel showed people in Mashhad, an important religious center in the northeast of Iran, chanting "Death to Rouhani". They also showed chants of "Death to the dictator" and "Not Gaza, not Lebanon, my life for Iran", a reference to anger in some circles that the government is focusing on the wider region rather than improving conditions at home. According to some reports, as many as 13 people were killed by Iranian security forces over the weekend in protests across the country. The Associated Press confirmed 12 of the 13 reported deaths. The Iranian government blocked some social media outlets and popular instant messaging systems, calling the move a "temporary" limitation intended to prevent protesters from organizing mass demonstrations. Both President Donald Trump and Israeli Prime Minister Binyamin Netanyahu have expressed their support for protesters, and called on other world leaders to back the demonstrations. On Monday, Iranian state media outlets claimed that a gunman opened fire on security forces stationed in the city of Najafabad during an anti-government protest. Iran claims the gunman shot four officers with a hunting rifle, killing one and wounding three. "A rioter took advantage of the situation in the city of Najaf Abad and fired shots at police forces with a hunting rifle. As a result, three were wounded, and one was martyred,” said police spokesman Saeed Montazer al-Mahdi, Reuters reported. Later Monday night, Israel’s Maariv news outlet reported that Iranian sources had claimed that the death toll in the shooting incident had risen to two. It is unclear if the second fatality was in fact linked with the shooting in Najafabad, or a subsequent shootings also involving hunting rifles. According to AP, at least nine people were killed late Monday night and early Tuesday morning, including at least one slain Iranian police officer and two others gunned down, apparently by protesters using hunting rifles. The latest string of deaths brings the total number of fatalities to at least 21. The remaining six deaths occurred in the city of Qahdarijan, Iranian state television claimed, when anti-government protesters attempted to force their way into the armory of a local police station. Iran has claimed that rioters have attempted to overrun police stations and military facilities across the country.